Increases the multi crit of nearby towers. Increases the multicrit of towers in 200 range by 2. Nature tower, increasing other towers attack speed, and able to store mana and release in a powerfull attack series. Aura increasing all towers attackspeed by 15% in 200 range. I think shaddow can't fix the the original tower idea, no offence. This sacred altar can control the growth of plants. All towers in 175 range will receive a gift of nature. When a gifted tower attacks a creep there is a 10% attackspeed adjusted chance to entangle that creep for 1.2 seconds, dealing 700 damage per second. Does not work on air units or bosses! Elune, the goddess of the night elves joined this battle to bring death to the enemies of life. On each attack, this tower has a 1% chance to deal 100% of the target ' s max hp as spell damage to it. It ' s only 40% for Bosses and Challenges. Each attack that does not trigger this ability increases the chance by 1% and decreases the damage by 1%. The damage can ' t drop below 5%. When this ability triggers, the chance to proc and damage dealt gets reset. Increases attack speed and attack damage of all player towers by 50% for 5 seconds. Increases the attack damage and mana regeneration of all player towers by 5%. When active each attack has got a 45% chance to increase attackspeed by 300%. I think f12ight can't really fix this tower, no offence but try something easier to start with. This giant mushroom benefits from all other mushrooms. It grows only on big piles of corps. Increases the damage dealt by the Poisenous Spores by +20%. Plz change this tower, abilities like these are not allowed! A natural wonder, once lost to the sands of time, has re-appeared harnessing a spiteful vengence. 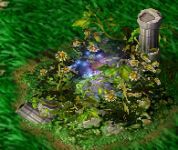 The garden uses half of the stored lifeforce to create a huge explosion, dealing [current spawn level x 15] spell damage in 1600 AoE for each lifeforce stored. 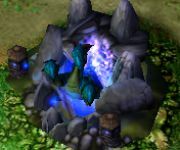 When the garden kills a nature, orc or human unit, its lifeforce is captured in the fountain. 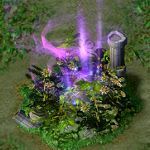 For each lifeforce stored in the fountain, the garden deals an additional [current spawn level x 2] spell damage on attack. Maximum of 5 stored lifeforce. The Hydras are one of the strongest creatures in the world. Every attack has a 30% chance to cast a stomp, dealing 500 spell damage and slowing targets in 850 range by 35% for 2 seconds. 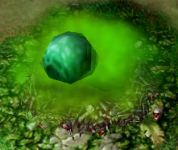 Poisons all attacked creeps, dealing 200 spell damage per second for 3 seconds. The poison stacks. Whenever " tail slam " and " stomp " trigger at the same time an earthquake appears for 3 seconds. Each second there is a seismic shock dealing 2000 damage to creeps in 850 range, reducing their movementspeed and armor by at least 20% up to 100% dependant on range. On each attack there is a 30% chance to hit all enemies which are in front of the hydra and in a range of 1200, dealing 500 damage and stunning them for 0.5 seconds. Can only stun the same creep every 2 seconds. Attacks up to 3 enemies at once. Attack speed back to 0.8, because of the balance... Stun still 0.5 and it has now a 2 sec cd on the unit. So 0.5 sec stun, 2 sec wait, can get stunned again.